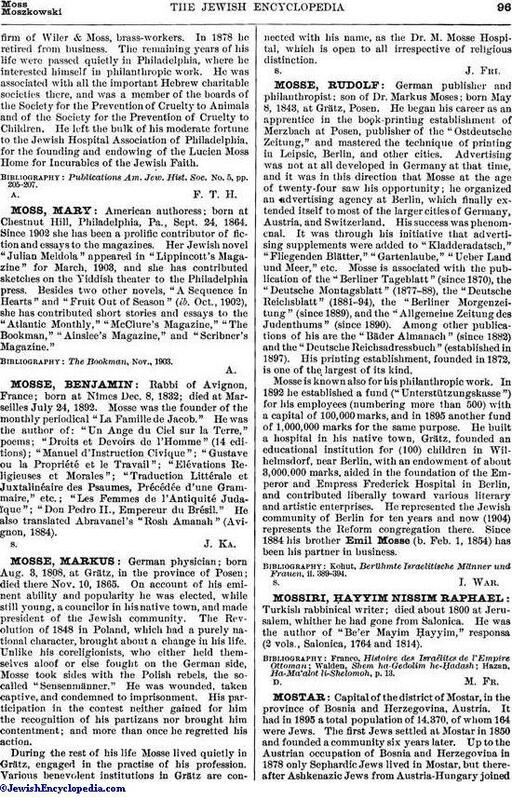 German publisher and philanthropist; son of Dr. Markus Moses; born May 8, 1843, at Grätz, Posen. He began his career as an apprentice in the book-printing establishment of Merzbach at Posen, publisher of the "Ostdeutsche Zeitung," and mastered the technique of printing in Leipsic, Berlin, and other cities. Advertising was not at all developed in Germany at that time, and it was in this direction that Mosse at the age of twenty-four saw his opportunity; he organized an advertising agency at Berlin, which finally extended itself to most of the larger cities of Germany, Austria, and Switzerland. His success was phenomenal. It was through his initiative that advertising supplements were added to "Kladderadatsch," "Fliegenden Blätter," "Gartenlaube," "Ueber Land und Meer," etc. Mosse is associated with the publication of the "Berliner Tageblatt" (since 1870), the "Deutsche Montagsblatt" (1877-88), the "Deutsche Reichsblatt" (1881-94), the "Berliner Morgenzeitung" (since 1889), and the "Allgemeine Zeitung des Judenthums" (since 1890). Among other publications of his are the "Bäder Almanach" (since 1882) and the "Deutsche Reichsadressbuch" (established in 1897). His printing establishment, founded in 1872, is one of the largest of its kind. Mosse is known also for his philanthropic work. In 1892 he established a fund ("Unterstützungskasse") for his employees (numbering more than 500) with a capital of 100,000 marks, and in 1895 another fund of 1,000,000 marks for the same purpose. He built a hospital in his native town, Grätz, founded an educational institution for (100) children in Wilhelmsdorf, near Berlin, with an endowment of about 3,000,000 marks, aided in the foundation of the Emperor and Empress Frederick Hospital in Berlin, and contributed liberally toward various literary and artistic enterprises. He represented the Jewish community of Berlin for ten years and now (1904) represents the Reform congregation there. Since 1884 his brother Emil Mosse (b. Feb. 1, 1854) has been his partner in business. Kohut, Berähmte Israelitische Männer und Frauen, ii. 389-394.